Push ups are one exercise that works the chest muscles. Your chest muscles are made up of the pecs in the middle of your chest and the serratus anterior at the sides of the chest. A strong chest complements both the female body and male body, helps you push heavy things with less effort and prevents upper-body injuries. The bench press works your chest, but it can be dangerous without a partner assisting you. Also, according to BodyBuilding.com, bench pressing doesn't necessarily isolate the chest or utilize it maximally. Luckily, there are plenty of effective ways to work the chest without bench pressing, and the more you mix up your workout with different exercises, the faster you'll see results. Pushups are exercises that work the chest using your own body weight as resistance. Depending on your level of strength, there are different types of pushups you can do to strengthen your chest. If the traditional pushup is too difficult, place your knees on the floor while the rest of your body is in traditional pushup position. If you're comfortable doing traditional pushups, try some variations of the traditional pushup to challenge your chest and work different parts of it. Do a staggered-arm pushup by starting in pushup position then placing one hand 5 inches vertically lower than the other hand. Do pushups as normal in this position and switch hand positions. For an extra challenge, lift one leg straight up in the air as you do traditional pushups. If you like to work out at the gym, there are a few machine weights you can use to strengthen your chest. The chest press machine mimics the arm action of pushups while you sit down upright on the machine. Whereas pushups utilize your body weight as resistance, the shoulder press lets you choose the amount of weight you want to press. You can also stand between two wide dip bars and do chest dips. Put the dip belt around your waist, grip one bar with either hand, and slowly bend your arms to "dip" your body down and rise back up to repeat. Finally, sit on the butterfly machine, also called the pec deck machine, and do butterflies. Position your arms on the handles as directed on the machine and push the handles together and apart. This exercise is able to work the chest in a way bench pressing can't, because it forces you to use your muscles to open and close the chest. You can also use different types of free weights to work the chest, including dumbbells, kettlebells and medicine balls. Do chest flyes using dumbbells to work the whole chest. Lie on your back on the floor or on a flat bench and hold dumbbells together directly above you so that your arms are perpendicular to the floor, with your elbows slightly bent. Open your arms until they're almost parallel with the floor, bring the dumbbells together again and repeat While you're lying on the floor or a bench, do kettlebell floor presses, which can be done with dumbbells if you or your gym doesn't have kettlebells. Hold a kettlebell in each hand, with your arms straight and perpendicular to the floor. Lower one kettlebell at a time directly down to the side of your chest. You may have fun with chest pushes using a medicine ball. Hold a medicine ball to your chest with both hands while kneeling. Push the ball directly forward as hard as you can, as though you were passing a basketball to a teammate. Finish by falling forward into a pushup position with your knees on the ground. Want to strengthen your chest without lifting weights? Swimming, yoga and Pilates are good activities to try if you haven't already. The breaststroke and butterfly stroke in particular give the chest a good workout. In yoga, many poses involving arm balances work the chest, such as Firefly pose and Shoulder-pressing pose. If arm balances are too challenging, start with Plank pose, Side Plank pose and Dolphin Plank pose. Pilates uses your own body weight, as well as resistance bands, for various chest exercises. 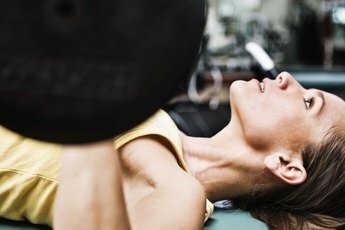 When choosing the amount of weight to lift at the gym, keep in mind that doing more reps with smaller amounts of weight builds strong but less bulky muscles, whereas lifting heavy weights for just a few strenuous repetitions "pumps" your muscles and makes them look big, especially within the hours following your workout. According to the American Council on Fitness, an appropriate number of repetitions is 12. You want to find a weight you can lift for 12 reps without it being so hard that you lose the correct form and without it being so easy that you could continue doing reps without a break. Do up to three sets of 12 reps with a 30-second or longer break between sets. To strengthen your chest more quickly and effectively, incorporate a variety of chest exercises in your workouts and do different types of workouts on different days of the week. But don't do weight training on two consecutive days to prevent overtraining. Building chest muscles definitely has an aesthetic appeal, but don't focus on the chest so much that you neglect your other muscles. According to ACE, strength imbalances that arise from training some muscle groups but not others can cause problems with your posture and even injury.